Improving skills is an important part of today’s professional life which is why a number of training programs are organized and attended by people all around the world. However, even the training professionals need a feedback of what the participants thought about the program. After all this is what will help them to improve their modules. It is for this purpose that they use training evaluation forms. The Evaluation Forms comprises of a number of queries which the participants need to answer. This form is used by the training agency which may have been hired by an organization to offer some training to its employees. The form contains a number of questions which help the trainer to understand how well the employees understood the program and how they have benefitted from it. You may also see Employee Evaluation Forms. Training agencies design a number of courses which they use to enhance different skills of the participants. At the end of each session, they hand over this form to the participants and expect them to fill it up with their feedback. This in turn gives them an idea of the efficiency of their course and how they can improve it further. 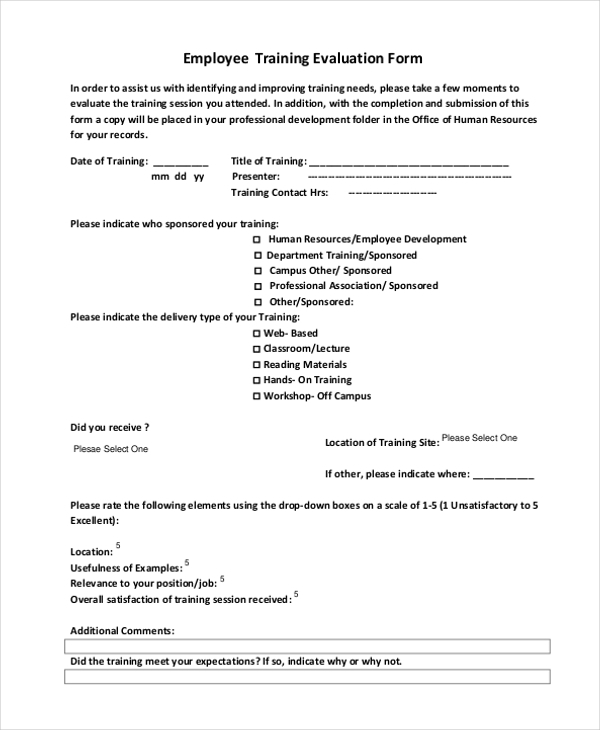 As the name indicates, this form is used by an organization to query its staff about the training session that had been organized by the company. The form contains a number of queries the answers to which gives the top management an idea of the efficiency of the training program. 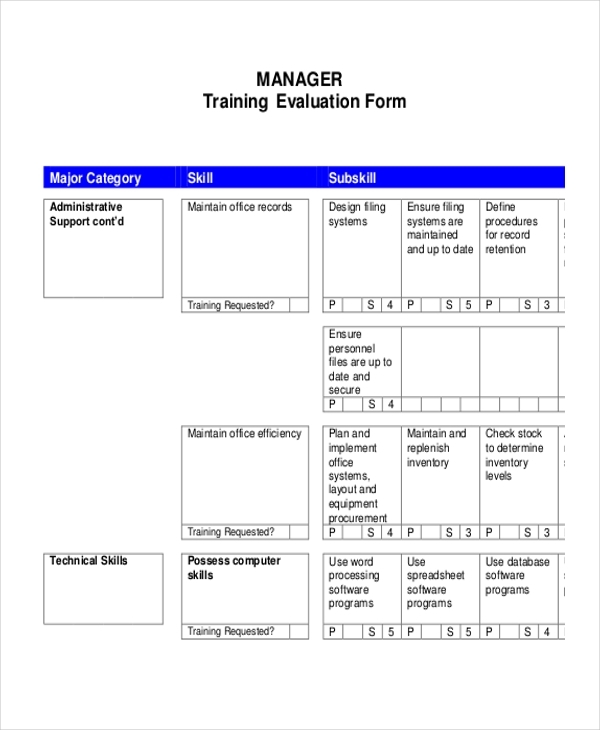 When a training program is organized for the managers of a company, they are handed over this Presentation Evaluation Forms at the end of the session. The form contains a number of queries about the session. The data collected using these forms gives the trainer an idea of how the session can be further improved. 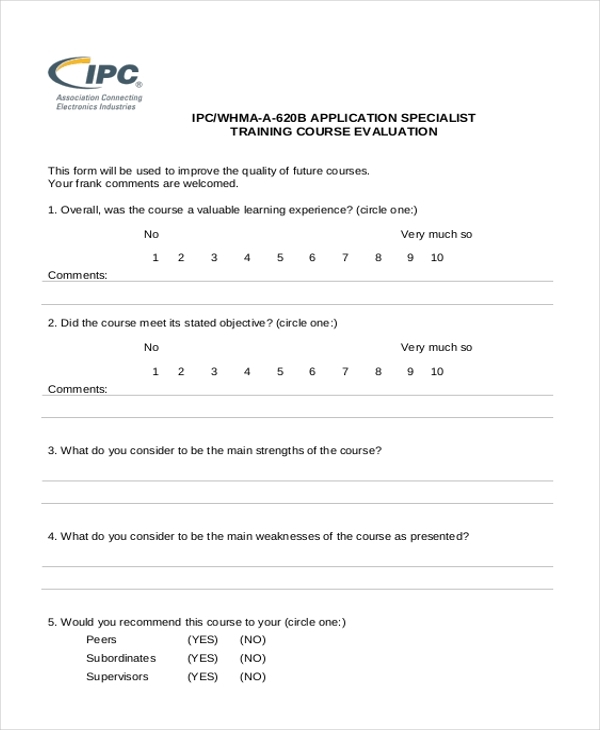 This form is used at the end of a sales training session to evaluate the reaction of the participants towards the whole program. The participants are required to give in their feedback in this form by answering the various queries present in the form. As the name indicates, this form is used to evaluate the effectiveness of a safety training program. The form comprises of a number of queries related to the program which the participants are required to answer. This in turn helps the trainer to understand the strengths and weaknesses of the program. When an organization arranges a retraining program for its supervisors to enhance their skills, it uses this Program Evaluation Forms to understand how the participants have benefited from the program. This form is used by a trainer or a training agency to acquire the feedback of the participants. This in turn gives them an idea of what the strong points of the training are and which are the areas that need more attention. 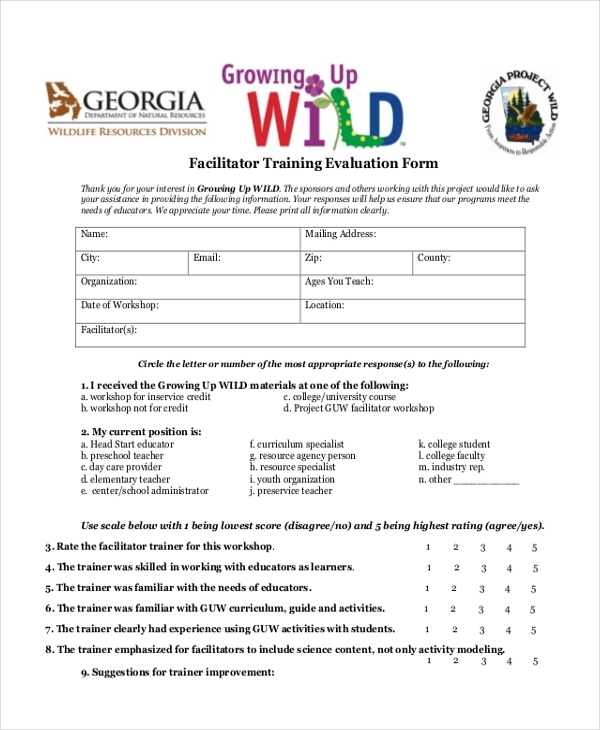 As the name suggests, this evaluation form comes in handy when training programs are held to improve the skills of facilitators. These forms are handed out to the participants who are then asked to evaluate the training program. 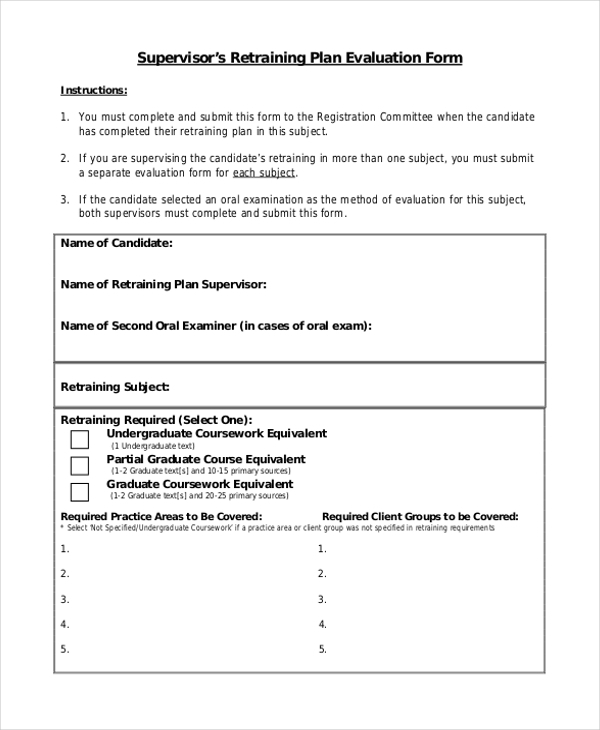 You can also see Teacher Evaluation Forms. What are The Benefits of Using Training Evaluation Forms? 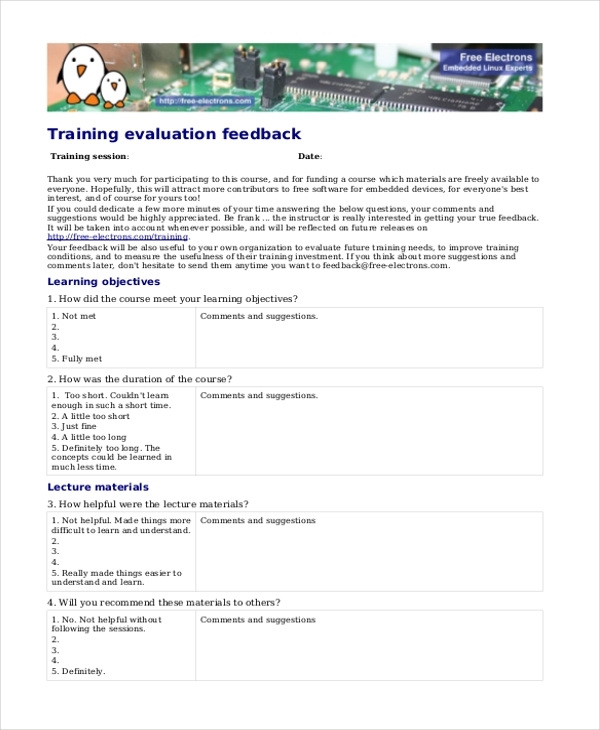 Not sure how to design a Training Evaluation Forms? Don’t worry. Just check out our huge collection of program evaluation forms and find the one that is perfect for you. 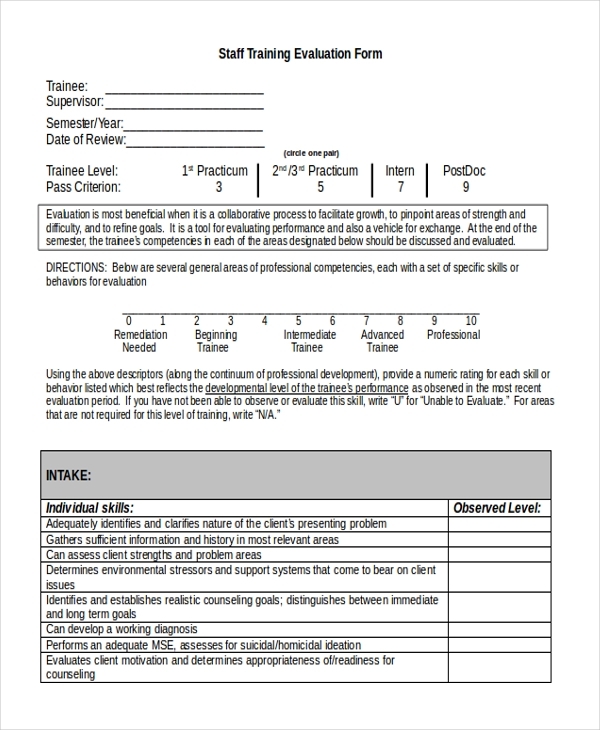 These forms are easy to download and customize, thus ensuring that you can come up with a unique training evaluation form within minutes.